In spring 2014, her new album "Introducing" (Neuklang/Edel:Kultur) was released. After several solo albums, it is a trio album, with Juan Camilo Villa Robles on bass and Miguel Altamar de la Torre (both from colombia) on drums. As "special guests" she got the honor to get german trumpet player and Echo Jazz Winner Joo Kraus, even moroccan Rhani Krija, the Percussionist of STING. In August 2014, she gave her debut as classical pianist and showed her musical variety, when she performed Bach’s g-moll concerto with the Queensland Symphony Orchestra in Brisbane/Australia, conducted by Gustavo Gimeno. Marialy Pacheco performed at national and international festivals like Aalener Jazzfest, Enter Music Festival (Poland), St. Moritz Art Masters (Switzerland),Rheingau-Musik-Festival, ZMF Freiburg, Jazzfestival Oloron (France) Audi Jazzfestival, Ingolstädter Jazztage, Piano City Milano, Havana Jazzfestival and at Beethovenfestival Bonn. In June 2016, she presented the project “Danzon Cubano” together with WDR Funkhaus Orchestra, even presented on Live-Stream at ARTE TV concerts. The project was represented in September at the Beethovenfest in Bonn. 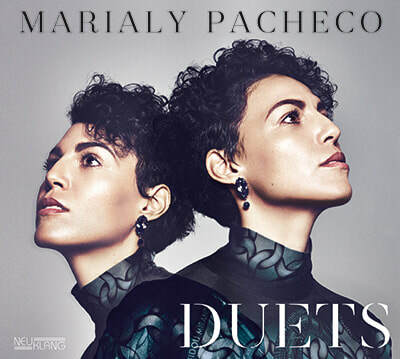 In April 2017 Marialy will release the new album "DUETS" – quite an intimate and many-faceted album to which Marialy has invited her favourite musicians and friends like Hamilton de Holanda, Omar Sosa, Joo Kraus, Rhani Krija, Miguel Zenon and Max Mutzke.